The word Scuba is actually an acronym for Self Contained Underwater Breathing Apparatus. Scuba diving is swimming underwater using SCUBA. Using a cylinder of compressed gas to breathe (usually air, but sometimes other gases), scuba divers can stay underwater much longer than would be possible by just holding their breath - for hours or even days. It may be done for recreation, industrial or commercial purposes. Scuba diving commonly refers to two things. 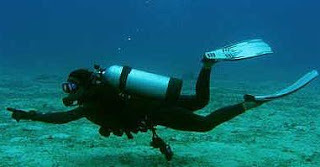 First, as the activity of diving under water with the aide of a breathing apparatus and swimming gear. As an activity, scuba diving has been generally categorised into skin diving and free diving. Second, as the equipment used in swimming underwater. As an underwater diving equipment, SCUBA, an open-circuit apparatus allowing the user to breath air contained in a tank, placed over the back of divers. Scuba diving developed out of man's drive to survive and learn more about life underwater. With new technology, the reasons for wanting to breath underwater diversified. Initially, this was considered as a profession and source of livelihood. Then this became viewed as a scientific research exploration before becoming a recreational activity. Why is scuba diving popular? Over two-thirds of the planet is covered by water. The allure and mystery of the underwater world has inspired the human imagination since prehistory, from the mythological monsters described by seafaring people, to the science fiction of Jules Verne and the modern underwater adventures in Hollywood films. Breath-hold diving, dangerous though it can be, has been used to collect pearls, sponges and valuable commodities from the sea floor for many generations. Advances in underwater exploration began nearly three centuries ago using diving bells and large cumbersome sealed suits using pumped air from the surface. Only very recently advances in technology and mechanics have allowed people to visit this domain safely for exploration using comfortable, self-contained air delivery systems. For some it is the beauty of the reef and the marine life that inhabits it, for others it's the thrill of discovery deep inside a wreck or cave - everyone has a different reason for scuba diving, but most would agree that it is for the sheer enjoyment of experiencing the underwater world, a world so far removed from ours that it will truly amaze you. Whether you want to relax while photographing brightly colored tropical fish, be thrilled by the power and grace of a school of sharks, or make a living working underwater, scuba diving has it all. Recreational diving or sport diving is a type of diving that uses SCUBA equipment for the purpose of leisure and enjoyment. In some diving circles, the term " recreational diving" is used in contradistinction to "technical diving", a more demanding aspect of the sport which requires greater levels of training, experience and equipment. After Open Water certification you can complete courses in all sorts of specialties including, but not limited to: night diving, wreck diving, deep diving, navigation, fish identification, underwater naturalism, photography, videography, cave diving, ice diving, altitude diving, and rescue diving. Technical diving, also referred to as Tec diving is a form of scuba diving that exceeds the scope of recreational diving. Technical divers require advanced training, extensive experience and often breathe breathing gases other than air or standard nitrox. Technical dive encompasses areas such as extreme deep diving, advanced wreck diving, and advanced cave diving. Technical diving is for very experienced recreational divers and requires specialised training and equipment. Commercial divers dive for a living. They build underwater structures such as oil platforms, fish farm maintenance, carry out underwater maintenance, conduct surveys, create maps, carry underwater welding, participate in salvage operations, and work in many other diving related occupations. Military diving covers all types of diving carried out by military personnel. Military diving is similar to commercial diving but also involves such tasks as underwater surveillance, mine clearing, and military research. Military divers and scientists have historically been responsible for most advances in dive equipment and dive medicine. Naval diving is the military term for commercial diving, and is drastically different from military diving. Naval divers work to support maintenance and repair operations on ships and military installations. Police divers are normally police officers who have been trained in the use of diving techniques to recover evidence and occasionally bodies from rivers, canals and the sea. They may also be employed in searching shipping for contraband substances fitted to the outside of hulls to avoid detection. The equipment they use depends on requirements, but the requirement for communications at some sites does often require the use of full-face masks with communication equipment, either with SCUBA or surface supplied equipment. Scuba diving is about a sport that is practiced recreationally all around the world and can even be a profession. There are many diving jobs such as recreational dive master and instructor, commercial diver, police diver, scientific diver, and military diver. Scuba diving is about diving that offers people the opportunity to see what life is like below the water in lakes, and oceans. Scuba divers wear equipment which allows the divers to stay below the water's surface for long periods of time. Thanks for sharing this Info and explaining What is Scuba Diving. Good post about scuba diving. Scuba diving is a very challenging sport and nowadays millions of tourists are planning vacations, looking for travel deals to tropical destinations. The magic of this sport can be felt everywhere in the world.